Tire Order Processing provides one system for new tire sales, retread sales, labor, and mechanical. Order Types include Point of Sale, Service Orders, Industrial/Forklift Orders, Adjustments, Credit Memo's, and Quotations. Extensive lookups for customers include Account Number, Customer Name, City, Vehicle License, VIN, Phone number, Contact names, and more... Instant access to your customer information helps streamline the order process. 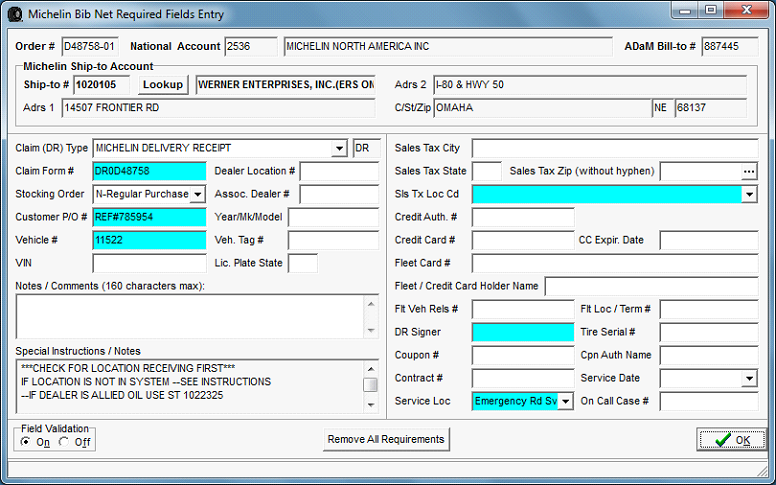 Show credit information and optional accounts receivable at a glance. With sales history display and customer/item history, you can view your customer's buying habits and last pricing. 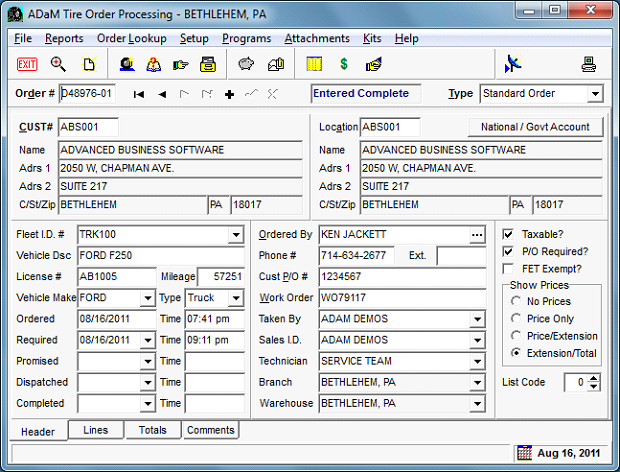 Access to open orders and drill down to order inquiry will give you quick and complete information about the customer. The system is designed to handle F.E.T. conditions plus variable and complicated tax situations. Other features include fleet tracking and easy to use National Account / Government Account interface. Associated items and/or kits can be suggested or automatic. The Inventory Quick Display provides a powerful and useful feature to the ADaM Tire Order Management system. The Inventory Quick Display allows you to look up inventory by Size/Ply, Manufacturer, and/or Application. View pricing and availability. Filter options can show only items available in your current location or view the item available in all locations. Quick drill downs for an item to show spec sheets, images, and other important documents. Quotes can be produced directly from the Quick Display including price, taxes, adding kits for 'out-the-door' pricing. Quotes can be saved, faxed, emailed and eventually turned into a tire order. Customer information is also available with a few clicks directly from the Quick Display. The Inventory Quick Display can be run stand alone and is also integrated with tire order processing. National Account processing is built in to the order process and provides easy entry of required data. ADaM Tire Order Processing handles national accounts for Michelin, Goodyear, and Bridgestone/Firestone. All of the processing and communications is done through electronic interface. Electronic Data Interfaces include Delivery Receipts (DR), Inventory, Invoicing, National Account credits, Inventory Invoicing, with the automated interface directly into ADaM Accounts Payable and Accounts Recievable. Special features include easy order splitting for cost recovery billing. 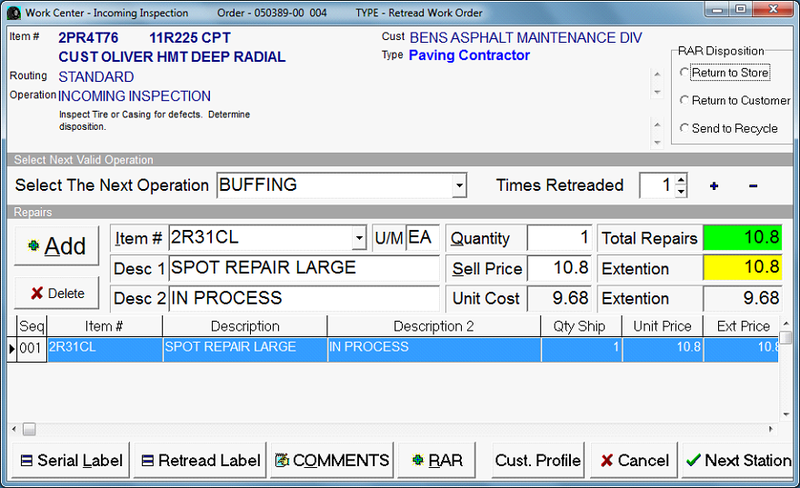 The Bibtread Interface for Retread Tire Status is a real-time and near real-time system to view retread process status and manage retreads. 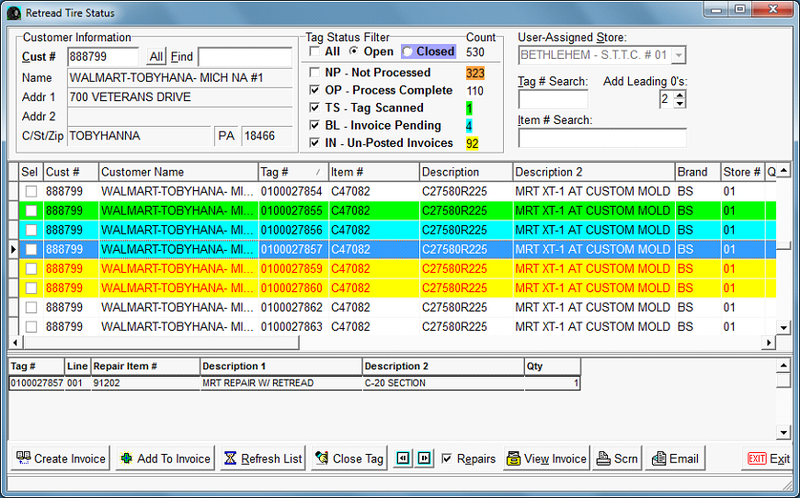 Filter options provide display of Customer or Store retreads. Repairs and casings can be viewed by tag. 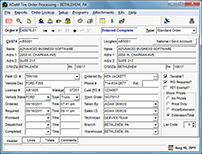 Sorting is available by customer or item. A tag search feature allows individual tags to be searched for location and status. Retreads can be selected for invoicing. The integrated RF barcode system can scan for delivery or transfers. Retreads can be added to open invoices and retreads can be combined with casing credits, disposal fees on one invoice. When retreads are finalized the ADaM Inventory is updated, raw materials are relieved and the General Ledger is updated. The ADaM Retread Plant Management software system is available for tracking retreads from pick up, to final serial number assignment. User defined operation routing guides the retread process through the plant. When an operation is completed, the system instructs the operator what and where the next operation is. An example of flexible operations routing might include Incoming inspection, Buffing, Casing repair, Building, and Final inspection. With the Retread Plant Mangement system you can tracks repairs, raw material usage, costs, and interface to the ADaM Inventory and General Ledger. Barcoded serial number labels can be generated as well as Finished Goods labels. The system is optimized to be used with ruggedized touch screens with keyboard and mouse input optional. The Retread Plant Management system also includes process inquiry and management screens. 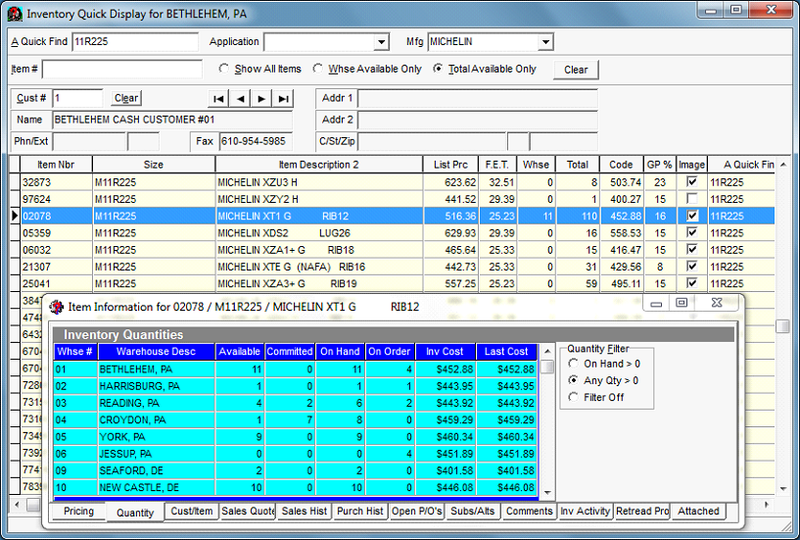 Tire orders for dispatch are sent to the Dispatch Control system directly from Tire Order Processing. 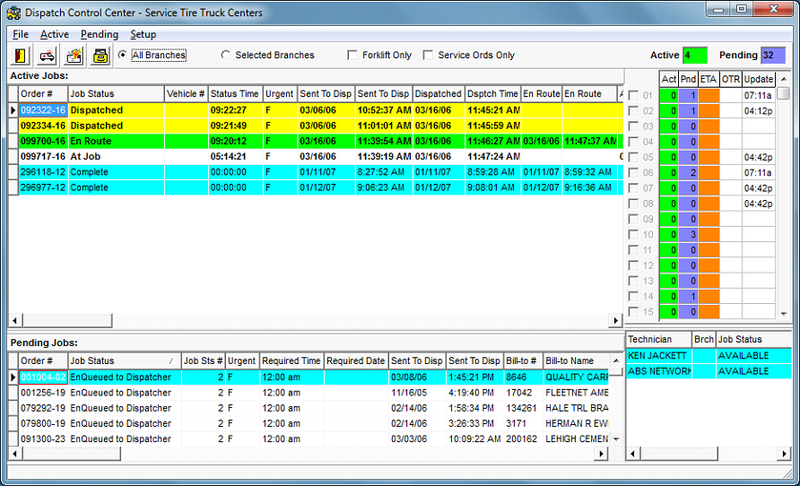 A dispatcher can assign and control tire orders by service technician. A single view displays the queue of jobs pending dispatch plus the active jobs in progress. Dispatched tire orders can be updated via phone, text messaging or truck installed GPS devices. Realtime Google interface for address validation and map view for driver assistance. Track job status by Dispatched, Driver En Route to Job, At Job, Job Complete. Date/Time stamping for statuses is available for Job and Time analysis.